1. Contains more magnesium. One cup (195 g) cooked brown rice contains 84 mg of magnesium, while white rice in the same amount only contains 19 mg of magnesium. 2. Rich in fiber and fatty acids. In plain white rice, bran layer take part in the peel, the content in the oil-rich layer fiber and cellulose would also be lost. In fact, some research suggests that the oil content in the skin layer in rice can help lower LDL cholesterol. So nutrition missing including fiber and fatty acids. While brown rice still contains layer of the fiber and cellulose. 3. Prevent constipation. Due to the high content of fiber, besides nutritious, brown rice also able to prevent constipation so facilitate digestion. However, the effect it depends on the habits consuming and washed or not brown rice before cooking. 4. It is suitable for the diet. High content of fiber which also makes You're more satisfied and not easily hungry making it suitable for diet. 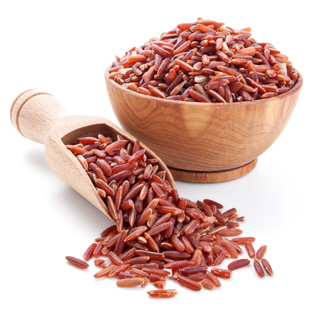 Wrong One example, brown rice is used Deep Dish macrobiotic diet, which theory is a dish that is not many experienced processing considered to be more healthy. 5. Rich in amino acids and GABA. One way to cook brown rice is known is the technique Gamma-aminobutyric acid (GABA), or germinated brown rice (GBR) is emerged as the International Year of Rice. How, brown rice soaked in warm water (38oC) for 20 hours like white rice before cooking usual. This process will stimulate germination so as to enable various enzymes in brown rice. By way of cooking like this, be derived amino acid content A more complete, including GABA. GABA has also been known to increase growth hormone on humans. That's why brown rice is perfect for bodybuilders who desperately need acidic protein acids for muscle development and instead of plain white rice. 6. A source of manganese minerals. 100 grams of brown rice contains 1.1 mg manganese or able to meet the 55% manganese mineral daily needs.